Evidence shows that the first residents of Oakley were Indians of the Miwok, Yokut and Ohlone Tribes. In recent years camp sites, burial grounds and many artifacts have been found. In 1986 several Miwok skeletons were found in the Big Break area and an Ohlone pestle, a stone tool for grinding grain and acorns, was found in 1992 near Village Parkway. During the 1700’s when California was part of Spain, Captain Pedro Fages passed through this region of California recording the first history of the area. Doctor John Marsh was the first Anglo settler in Contra Costa County and arrived on the scene in 1836. He built a riverboat freight landing on the San Joaquin River in the 1840’s near what is now Oakley. This was the first landing built in the county. In the early days, before the arrival of adequate roads and the railroad, the rivers acted as the primary means to transport goods. Much of the materials to build John Marsh’s home, the Stone House, were delivered to Marsh Landing and transported by wagon to the building site on Marsh Creek Road. Marsh Landing was very important to the early development of Oakley and the surrounding region. Most people thought that the sandy soil in this section of Contra Costa County was not good for farming. It was covered with chaparral, oak trees, coyotes and jack rabbits. When the first settlers arrived wildlife was plentiful in what was then a wilderness. Flocks of wild ducks, geese, white swan and pelicans could be seen along the waterfront. Great droves of wild horses, elk, deer, wild boar and an occasional bear passed through enroute to the river. Early settlers of the area were laughingly referred to as Sandlappers as it was said that “only jack rabbits and coyotes can thrive here”. Within a few years Oakley’s orchards were blooming, and the little town was booming and no longer was anyone making fun of the settlers. James O’Hara was one of the first settlers in Oakley when he arrived in 1889. He purchased seven hundred acres of government grant land for five dollars an acre. He later sold most of this land to other settlers for fifty dollars an acre. He knew the common belief was that the sandy soil of the area was only good for growing chaparral and oak trees. It took his insight and the planting of nut trees and grapes to prove the sandy soil was good for growing crops. Andrew Portman was one of the first settlers to reclaim delta lands by building levees. He hired Chinese laborers for about twenty-five cents a day to pack wheelbarrows full of dirt into long mounds high enough to retain the tidal waters. He then planted hundreds of acres of wheat, alfalfa and hay in the rich peat soil. In 1897, Randolph Marsh purchased twelve acres of land and planned a town. Marsh is credited with naming Oakley for the trees that occupied a large portion of the natural landscape. However, there is a great story about how Oakley was almost named Dewey. It seems that Randolph Marsh and another settler, Joel Wightman, couldn’t agree on the town’s name. Wightman wanted to name the new community after Admiral George Dewey, a hero of the Spanish American War, and Randolph Marsh wanted to name it Oakley. They decided to play a game of cribbage. The winner of the game would name the town. Marsh won, and Oakley was officially named. Alden Norcross joined Randolph Marsh in further developing Oakley when they purchased an additional nineteen acres and plotted the town. They recorded the maps, and Oakley was founded. The first business to be established was a mercantile built by Joseph Jesse. Marsh agreed to give Jesse the land for free hoping that with one store built it would encourage others to come. He was right. There was soon a blacksmith shop, saloon, hotel, railroad depot, barber shop and more. Some of the first merchants were John Augusto, Jerry O’Meara, Henry Janssen, Frank Silva, William Carpenter and Arnold Van Kathoven. Oakley’s boundaries at the turn of the century were Dutch Slough on the north, on the east Marsh Creek, and to the south sand hills covered with chaparral. On July 1, 1900, the first Santa Fe train stopped in Oakley. The Santa Fe Railroad provided the spur needed for agricultural growth of the area and afforded local farmers a means of transporting their products to market. Oakley’s first school was the Iron House School organized in 1862 by Sarah Abbot Sellers. Iron House was the first school east of Antioch. The Oakley School opened in a tiny building downtown in 1903 and was moved to a schoolhouse on O’Hara Avenue between Acme and Ruby Streets the following year. In 1904, fifteen students were enrolled at the school and by 1920’ the school had been enlarged to three rooms with a teacher for each room plus a principal, Edith Berta Dal Porto, and an enrollment of fifty students. In 1908, Salvador Dal Porto, a boarding house operator from Jackson, settled in Oakley. Dal Porto was instrumental in the development of Oakley’s business district. It didn’t take long before the town had two social halls, four churches, two saloons, a barber shop, two grocery stores, a blacksmith shop, several warehouses, a bank and many more businesses. 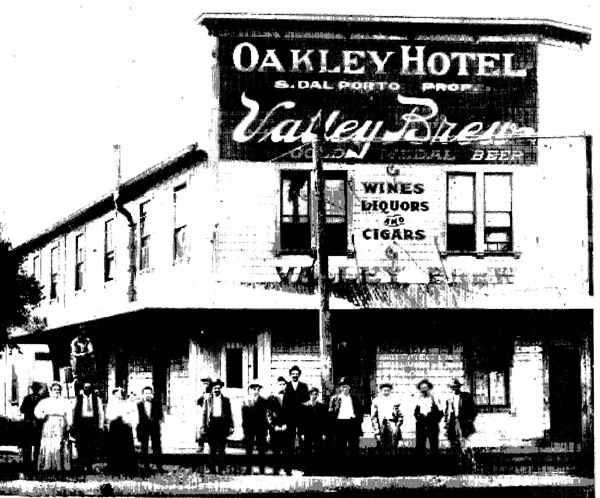 In 1910, Dal Porto purchased, remodeled and enlarged the Oakley Hotel. In 1917, the Bank of Oakley was established. The Ladies Improvement Club was organized in 1913 with Mary O’Hara serving as the first president. These women were instrumental in the development of Oakley’s first library. A small library was first housed in Farrell’s general store offering the residents of Oakley three hundred books. In 1916, the Ladies Improvement Club purchased the Congregational Church building for a clubhouse and public library. The Ladies Improvement Club later changed their name to the Oakley Women’s Club. In 1924, the Oakley Hotel and most of the businesses downtown were destroyed by a fire. Dal Porto rebuilt his hotel and several other businesses. He also installed a waterworks. He remained one of the town’s most prominent citizens until his death in 1932. By the 1930’s there were packing sheds along the Santa Fe spur that shipped carloads of produce to eastern markets. During harvest time, Oakley was filed with men that had come to work in the fields and packing sheds. It took a special breed of pioneer to settle in the Oakley area. It was necessary to face long hot summers with winds blowing that would cover everything in sight with the local sand. Note: The City of Oakley was incorporated in July 1999.